Someone asked a while ago for a Russian rod tube Theremin. It’s been 25 years or so since I published a design so I figured it was about time. I wanted to design a tube Theremin that, like the last one, could be built using readily available parts. The Russian rod tubes on ebay are plentiful and cheap but the variable transformers and capacitors have virtually disappeared. So this design uses rectifier diodes as variable caps and molded inductors placed side-by-side and adjusted by bending them closer or further away from one another as the variable transformers. One feature that allows this design to approximate the sound of the RCA is the dual grid tube used as the mixer. It provides enough isolation between oscillators that audio frequencies down to a few hertz can be produced. L5 and L6 are spaced so that a scope probe near the pitch antenna indicates max when the “pitch trim” knob is at 12 o’clock. Monitoring the “preview” output and with the fixed trim pot wiper at 20volts, L11 and L12 are adjusted for an audio tone. Zero beat is adjusted with the fixed pitch trim pot. L13 and L14 are spaced for a maximum indication with a scope probe near the volume antenna with the “volume” control at 12 o’clock. The antennas are the same as for the Etherwave. There is a lot of room for experimentation. This is only a suggested place to start. However it really does sound great. Using inductors side-by-side to form a weakly coupled transformer isn't something I would have thought of - is it difficult to tune? Does it drift much? What part numbers are you using for the series inductors going to the antennas? I've often thought the best way to tune out environmental C is to have a tiny variable C from the antenna to ground, though I don't have direct experience with this. Why do you have two diodes to ground on the 1.2V supply? Safety? Why is there a second tier to the PCB for that one tube? Is it difficult to tune? It really isn't. The range of the trimpots I used along with the capacitance of the diodes makes it pretty easy. Does it drift much? I left it overnight at zero beat and it stayed right there. The oscillators don't lock up so I think it's OK.
Why do you have two diodes to ground on the 1.2V supply? Safety? Just so. I just didn't want to blow all those rod tubes with a mishap as I was developing the final design. Why is there a second tier to the PCB for that one tube? The original design was to be closer to the RCA, with the volume circuit supplying the screen grid voltage for the mixer tube. It worked pretty well but there was no way to add pitch preview so I added a VCA tube. I'd say you maybe hit it lucky with those eBay inductors. Not all types will work as series EQ inductors. Early on in my own explorations I was using miniature ones that worked OK but had pretty bad thermal drift due to the hi permeability and fine wire. How did you ultimately come up with the final combined values? So does the tuning procedure involve bending those coupled inductors closer | farther away? Are you concerned with bumps and such detuning it? Early on in my own explorations I was using miniature ones that worked OK but had pretty bad thermal drift due to the hi permeability and fine wire. I suppose it has to do with how much current the particular circuit puts through them. There is very little RF or DC current through mine. How did you ultimately come up with the final combined values? Frequency generator loosely coupled to an etherwave antenna set with Bob's linearizing circiuts. Found the resonant freq for both antennas. Designed mine to be the same, just using those molded inductors and cut and try to get the same result. The self resonance of the molded ones is different than the Miller RFC's that Bob used. So does the tuning procedure involve bending those coupled inductors closer | farther away? Are you concerned with bumps and such detuning it? Once there are set I suppose you could put a drop of glue on them. They are only an eighth or so off the board and hardly any mass. If the thing got bumped hard enough to move them I'm sure you'd have way worse problems than just them moving. Thanks for sharing this really nice work and the circuit diagram. Can you post some sound samples? Concerning mechanic stability of the feedback coils: could toroidal filter chokes also be used? could toroidal filter chokes also be used? Sure, but then you'd have to wind them. I was trying to get away from someone wanting to duplicate mine having to wind coils and for that matter spend the money to buy toroid cores. your theremin based on legendary rod tubes warms my soul! Every year I take out a box with rod tubes, try different oscillator topologies and dream to build a theremin. In my last experiments I played with pentode 1J29B in transitron configuration and found it well oscillating down to 12 V anode voltage. 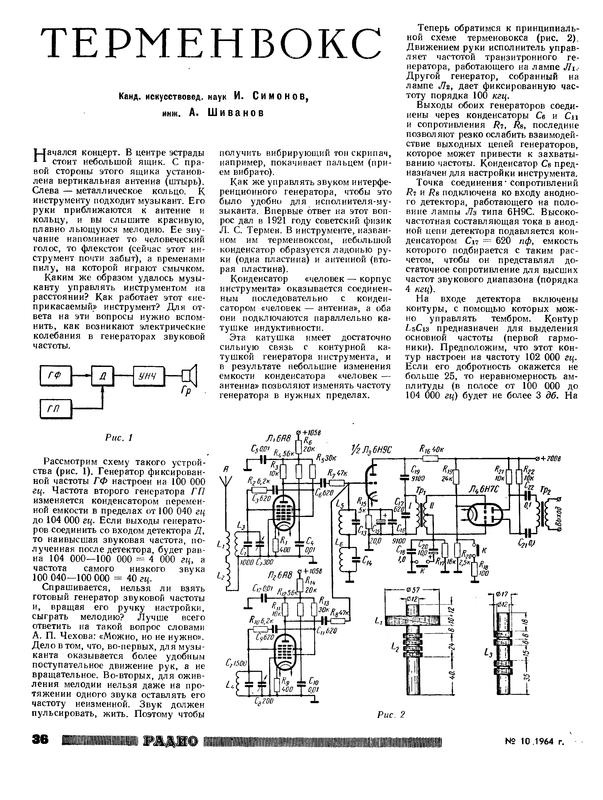 BTW, the transitron oscillator circuit was used in Simonov/Shivanov's tube theremin (link ). - "2P19B" ("2П19Б") tubes which were used in transmiter of the first Russian Sputnik ("PS-1")are not true "rod" tubes, as is declared in some articles. It had a grid based design, although the rod type tubes already were invented at that moment(and were used in the next space missions). - most of rod tubes saves the operablity at lowered anode voltages (down to 24 V). Some of them is designed especialy for low voltage applications (12 and even 6V) - "1J30B" and "1J42A" ("1Ж30Б", "1Ж42А", "Ж"=English "J" or "ZH"). - lifetime of rod tubes is ordinaly up to 5 000 hours. But dont use the "1J26A", "1J36B" or "1P32B"! Theyhave resourse less than 2 hours and are designed for military short-time applications (shells and missiles).